Summer is not the time to spend ages in the kitchen, especially on a glorious weekend day. This one-pan-and-a-couple-of-bowls recipe uses ingredients that are at their best in summer. 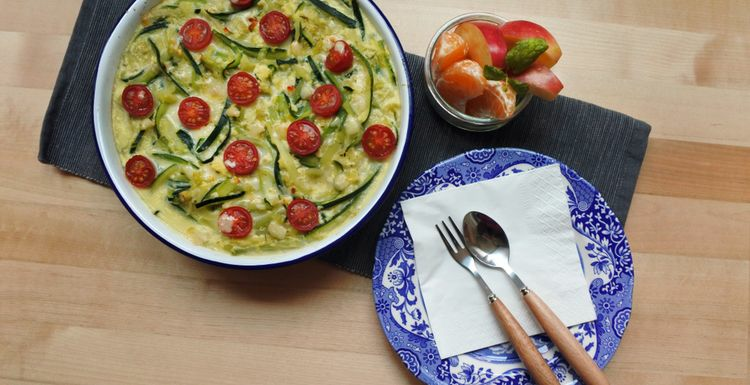 These are firm and flavoursome courgettes and tomatoes that even the supermarkets can’t get wrong at this time of year. Ingredients will be easy to find, there won’t be lots of washing up and the recipe doesn’t leave half-used packs. The courgettes need grating which takes a few minutes, but if you have a food processor it can be done in seconds. If there is no mint in a nearby garden, add a growing pot to your shopping list for the best flavour. Serves four. Your frying pan should be one that fits under the grill so that the dish can be browned. Wash the courgettes, then grate. This can be either by hand into a bowl or with a food processor. Cut the tomatoes into quarters or eighths. Crack the eggs into a bowl and beat with a little pepper. Throw in half of the crumbled feta and mix well. Heat the oil in a large frying pan. Fry the onion, courgette and mint for about five minutes until soft. Switch the grill on to ‘high’. Give the eggs and cheese another mix, then add to the pan and mix well. Stir in the tomatoes. Then cook on the hob for a few minutes until the egg starts to set. Move under the grill until golden on top and cooked through – keep a close eye! Serve from the pan, garnished with the reserved mint. Now I know what to do with the discounted courgettes I picked up yesterday - great idea. lunch is sorted - stressful football and tennis day and even a morning trip to the gym hasn't calmed me. Fingers crossed, but at least I will be well fed. this sounds very summery and fresh - perfect for this hot weather. Shame most of the family don't like courgettes. Perhaps I will have to eat it all myself! love it - this looks really easy and a recipe that doesn't take ages shopping or cooking works for me. The tomatoes are really tasty this year!